Researching the factors that differentiate self-made billionaires from everyone else, Sviokla and Cohen found that self-made billionaires were entrepreneurs who shared certain “habits of minds” that took form in what the authors term “dualities.” A duality is a set of two characteristics that complement each other. Based on an in-depth analysis, augmented by personal interviews, of the history and personalities of the self-made billionaires on the Forbes list of the world’s billionaires, the authors identified five dualities common to all billionaires. The first is empathetic imagination. Billionaires have the imagination to develop billion-dollar ideas. Those ideas, however, emerge from what the authors call “extreme empathy” for their customers’ needs and wants. For example, few people were buying mutual funds when 24-year-old Joe Mansueto began buying them in the early 1980s. Drowning in paper, after ordering the quarterly prospectuses from each fund he wanted to follow, Mansueto realized that investors would welcome a service offering a report that provided information for all comparable funds. Within two years, Morningstar was born. While the first duality concerned ideas, the second duality, patient urgency, frames the billionaire’s perspective. Billionaires, according to the authors’ research, are uniquely comfortable with both urgency and patience. They can work fast and super slow simultaneously, depending on the needs of the situation. As the authors explain, “They urgently prepare to seize an opportunity but patiently wait for that opportunity to fully emerge.” Groupon founder Eric Lefkofsky, who had failed with an earlier ahead-of-its-time website, painfully realized the value of timing. He also knew that the social media layer of Facebook, Twitter and others had made the time ripe for a deal-of-the-day site such as Groupon, and forged ahead with the idea that would make him a billionaire. The third duality, inventive execution, underpins how billionaires act. Execution is important, but that doesn’t mean that execution cannot involve creativity and imagination. Micky Arison, former CEO of Carnival Cruise Lines, turned the three-ship company of his father into the world’s largest cruise company, owning 10 established cruising brands. Through initiatives such as air-sea packaged charters, Arison reinvented cruising from a leisure activity for the elite to a mainstream vacation. Billionaires are not huge risk takers, the authors write. But, at the same time, they are less afraid of what they might lose now if there is an opportunity to create enormous value in the future. Having been fired from two real-estate investment jobs, Stephen Ross knew trying to start his own real-estate development firm had little chance of success. But the enormous risk of starting his own company was smaller than the risk of trying and failing again to work within the constraints of another firm. It’s this duality of the relative view of risk — balancing opportunity vs. potential loss — that separates billionaires from mortals, according to the authors. 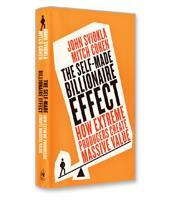 While the bulk of the book explores the dualities, the authors also detail, in this revealing, in-depth exploration into why billionaires succeed, the steps that companies can take to try to encourage and enable potential producers to succeed within their organizations — instead of leaving to start their own enterprise.